First of all, we want to thank all of you who contacted us about your enthusiasm for our project. We were moved that several of you wrote to us within moments after we launched our site on June 8th. It was thrilling to hear that Cubans on the island and beyond, as well as many who aren’t Cuban but care deeply about Cuba, feel we are moving in a positive direction by calling for bridges and the lifting of the emotional embargo. We were touched that several of you offered your support and want to volunteer to help us. We didn’t respond sooner because the site launched just as we were preparing for our trip to Cuba. For years Richard and I had talked about traveling to Cuba together. Finally the time seemed right. On June 13th, we met up at the airport in Miami. We were told to arrive five hours before our departure time. That turned out to be good advice. 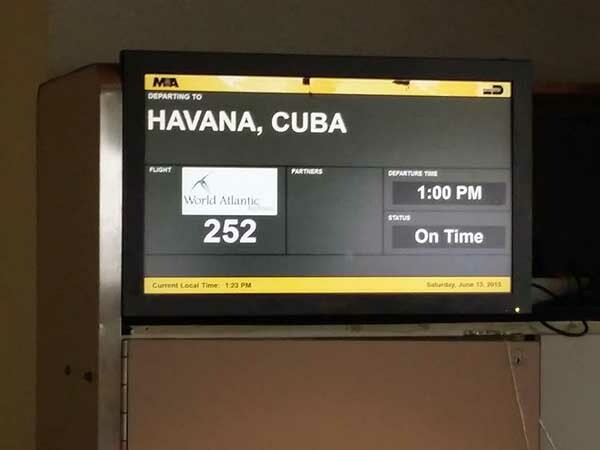 Several flights were leaving for Havana at the same time, and after we checked in, the lines got so long they snaked all the way down to the front door of the airport. In May, we would have seen Art Biennial types flocking to make the journey to Havana. But mid-June is the start of the low tourist season in Cuba. It starts to get much too hot on the island for foreigners. Our flight was filled only with Cubans bringing gifts for their families, plus the two of us, eager to share each other’s Cuba. Richard had traveled to Cuba in the past with his mother, while I had mostly traveled on my own, going a couple of times with my husband and son, but never with my parents, who still haven’t wanted to return. We knew it was going to be emotional going together. If you’ve been to Cuba, you know that one day in Cuba is equivalent to about ten days anywhere else in the world. Life is lived with a unique intensity on the island that is indescribable. 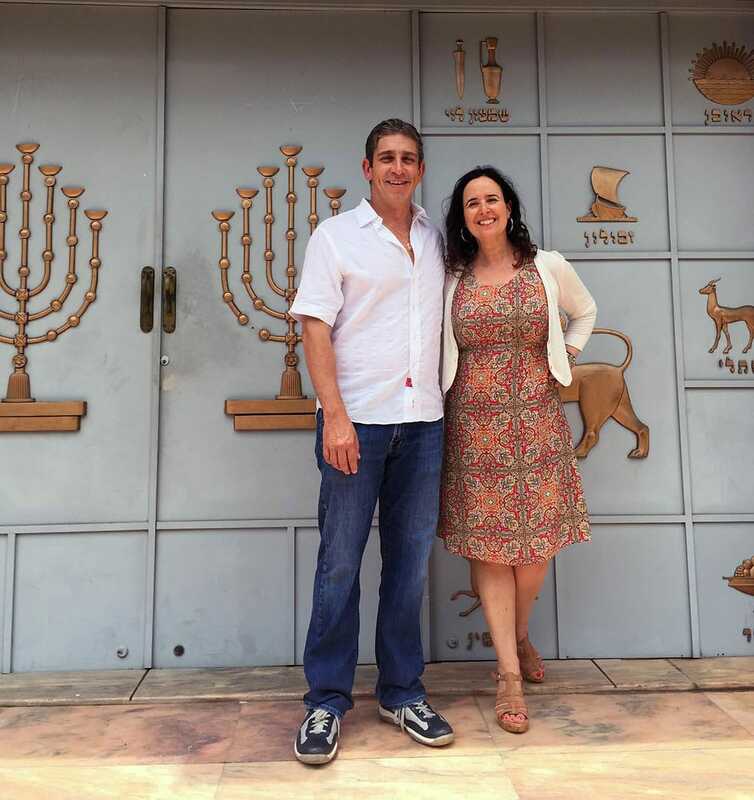 In Havana, we stayed in a rental apartment in the building where I lived as a child, which is half a block away from the Patronato Synagogue. The apartment is managed by our former neighbors, who proudly pointed out that our shower had automatic hot and cold running water and so we wouldn’t have to warm up water on the stove and take bucket showers, as most people do in Cuba. As soon as we got settled in, we took a long walk around Vedado, ablaze with bright orange flamboyanes at this time of year. I showed Richard the park where I played as a child, which has a gazebo that has remained unchanged over the years. The next day, accompanied by a historian-friend, Gerardo, and his wife, Amarilys, we took in La Habana Vieja from end to end. We had a look at the restoration work at the Capitolio, the mirror image of the U.S. capitol, and at the Manzana de Gómez, the first shopping arcade in Cuba, that once housed many elegant stores. Havana’s prized architectural monuments are definitely getting a facelift. 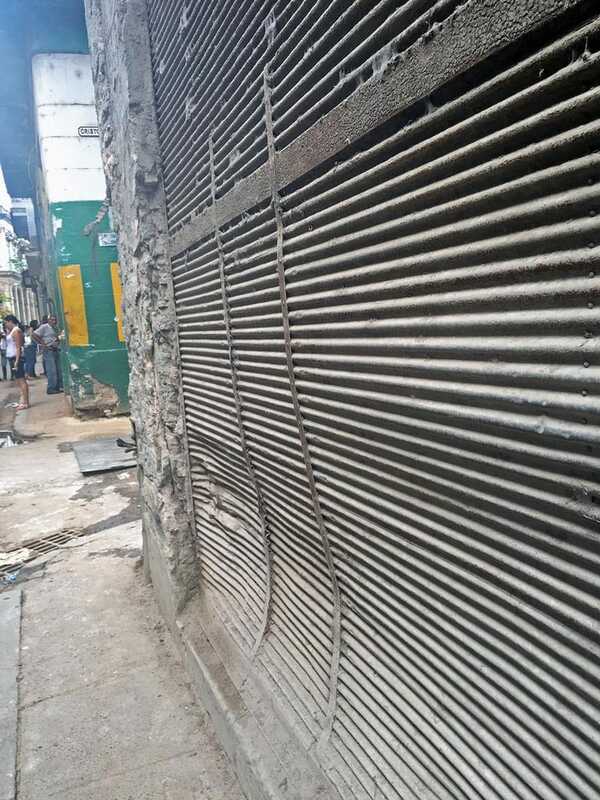 But when we walked down Calle Muralla, famed for its Jewish businesses, we saw the closed doors of abandoned stores and felt the ghostly sadness of those who fled years ago. As night was falling in La Habana Vieja, it began pouring, the kind of rain you only see in Cuba, rain that feels as if the world is coming to an end. We took refuge from the downpour in the lobby of the Hotel Plaza, next to a cage of loud parrots. We lost all sense of time until at last we stepped outside. Bienvenida was so kind I thought to ask her if she might drive us to Cienfuegos, where we planned to go next to visit with Richard’s family. She said she didn’t drive outside of Havana, but not to worry, she’d help us find someone. Sure enough, she contacted a fellow cab driver, and he in turn contacted another driver, Eduardo, who had recently ceased to work for the government and become an independent driver. Late in the afternoon, Orlando García, a writer and historian, and an old friend, invited us to meet with writers and musicians at the Cienfuegos branch of the UNEAC (the Writers and Artists Union). It was the night of Candelario Alvarado’s peña, which he calls “Escritrova,” because it combines writing and trova music. We shared poems in between the cortinas musicales, everyone participating, and gathering in a more intimate circle under the rooftop when it began to rain. 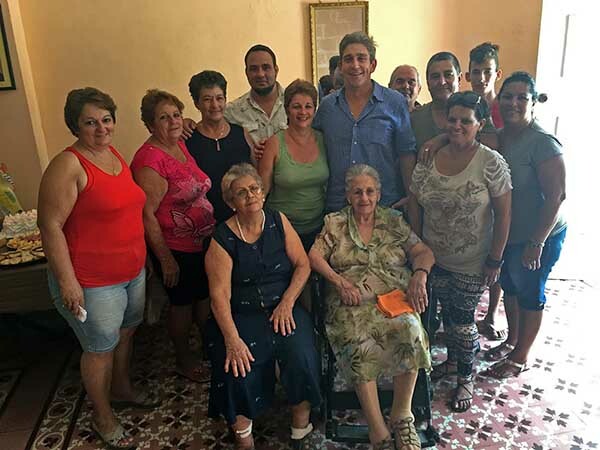 In the evening we hung out with several of Richard’s cousins on El Muelle, by the dock in Cienfuegos, and we talked about the future and what might come to pass with the reopening of diplomatic relations between Cuba and the United States. Will the Americans take over again, we wondered? One of Richard’s cousins very confidently replied, “Eso no va a pasar aquí. Olvídate de eso” (That won’t happen here. Forget about that). She, like so many others, seems certain that Cubans will know how to hold on to their independent and rebellious spirit into the future. There were more tears to come on the journey back to Havana as a phone call led our driver Eduardo to stop along the highway to receive a message from his former wife’s eighteen-year-old son. The ex-wife had left the previous day for Canada, with plans to immigrate, without telling a soul. Eduardo was beyond hurt. He tried to hold back the tears, but couldn’t, and it was all we could do not to cry with him as we drove into the city, passing the Malecón, Havana’s famous sea wall promenade, desperately holding back the great force of the ocean. Our last night we went to Café Madrigal, opened two years ago by Rafael Rosales, a filmmaker, who has filled the high-ceilinged space with massive art works, and ancient typewriters and projectors, and turned the bidet into a pot for his plants. 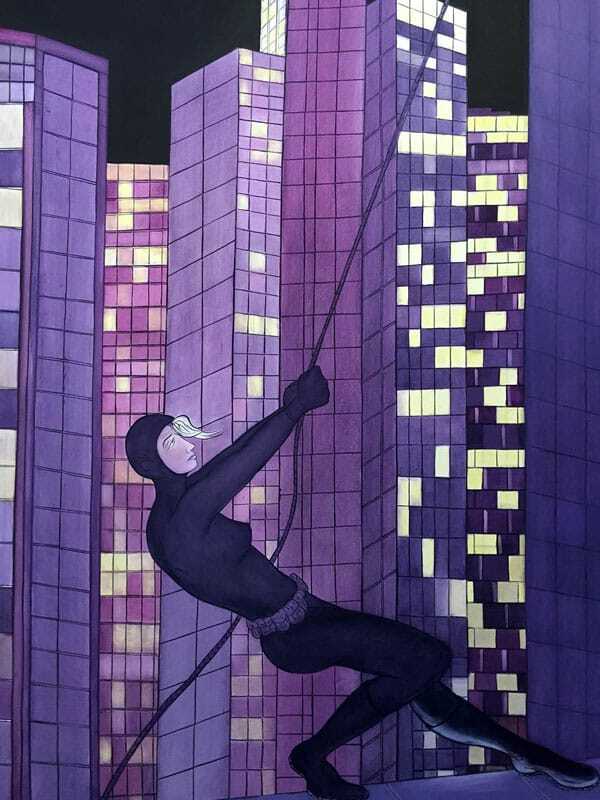 With us was another longtime friend, visual artist Rocío García, who studied art for seven years on a scholarship in St Petersburg, back when it used to be called Leningrad. It so happened that one of Rocío’s friends from Russia was visiting and over vodka and frituras de malanga we talked about pessimistic hopes for the future, Rocío translating from Spanish into Russian. Only in Cuba, we thought, could so many languages, cultures, geopolitics intersect in such an easygoing way. The flight back to Miami was delayed five hours and we’d gotten there three hours early for our flight, as requested by the airline, so we had a long wait in limbo before departing Cuba. Richard needed to smoke a cigarette. Something unexpected had happened in Cuba—it wasn’t possible to smoke in the airport anymore! But along with others, including airport personnel, Richard snuck in a quick smoke in the airport bathroom. Again, only in Cuba. We’ve returned inspired by this trip. 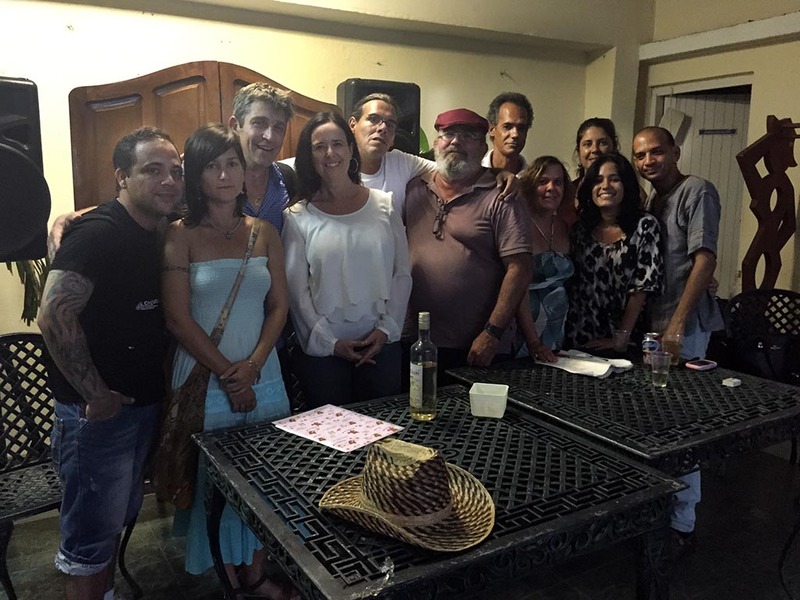 We saw so many possibilities for bridges among writers, artists, musicians, and Cubans of all walks of life. We’ll be sharing news of these and other stories in upcoming blogs. We look forward to your responses and truly feel grateful to all of you who are fellow bridge-builders. I want my favors not to disappear, but to live and last, if possible, all my friend’s life. I’ve roses in my garden. have wings to fly away. I won’t give that to you! Leave, then. Leave this garden. are not to be touched. What a wonderful visit! So promising. Thank you so much for sharing these experiences, photographs, and poetry. I am delighted that Richard feels he has two homes now. I know his search will continue. Gracias, Ruth and Richard, por esta iniciativa extraordinaria… y tan hermosamente llevada a cabo. Este espacio para compartir recuerdos, emociones, sentimientos, creatividad y amistades debe permitirnos construir esperanza a pesar de todos los pesares. Gracias. Disfrute cada momento del viaje gracias a la lucida descripcion y a las similitudes con mis experiencias en viajes recientes a Cuba. Y gracias por el poema de Dulce Maria. Enhorabuena. Espero leer muchas entradas mas. Very inspirational. I was very touched reading your article. You were so descriptive that I felt I was along for the journey. Although I left Cuba when I was 7 yrs old ( 44 yrs ago ) I have such a passion and love for the country and the people. Thank you for reminding me of the beauty that our island possesses. Thank you for sharing your trip with us. Please print the poem in its original Spanish form. Hi Cari, the whole blog is available in Spanish. On the sidebar you’ll see tabs for the English and Spanish versions. Thanks so much for reading! You as well as Richard are amazing. Always sending love &.light ..
son muy valientes,se meercen el reconocimiento internacional por su ardua labor contra el regimen de los castros,pero el mundo civilizado,esta enfrascado en otras cosas,y siempre los derechos humanos van hacer mancillados por los poderes economicos de los paises en desarrollo,a cuba la salvan los cubanos,como, no se,la rebelion en masa contra la injusticia,y como dice el himno de la patria,Al combate corred bayameses,que la patria os comtempla orgullosa,a no dejar que el gobierno de espana,siga apoyando la dictadura,y sacarlos de cuba siempre,una vez mas,como hicieron los patriotas de Bayameses en su epoca,ya saben como. I feel the preciousness of my gay culture as the world shifts to inclusion. What lies before me is unknown, perhaps unwelcome. I loved the private separateness that I can’t describe to new community. They’ll never know the rich culture we lived. I’m reluctant to open those doors to change. Ruth, Ricardo: gracias por la carta con la información de su reciente y emotivo viaje a Cuba. Me encantan las fotografías de las familias, de los artistas, de los escritores, y de ustedes. !Qué bello el poema de Dulce María! Muy a propósito de su aventura, allá donde subsiste el recuerdo como subsisten igualmente las memorias aquí. No hay diferencia entre cubanos. Es algo que se debe considerar seriamente al comenzar a construir puentes. Creo que el arte es un aliado, no tan sólo un vehículo, del acercamiento que se nos viene encima. Felicidades y sigan construyendo puentes. Sounds so wonderful. So glad you got to do this. I really envy you. I cannot describe how I feel after Reading your cronicle. I have tears and emotions. I am Cuban and had bad experiences because I was jailed as part of a Human Rights Group I barely knew it. I could have hate in my heart but I can. Cuba is my homeland and I don.t doubt you had a great time and there are a lot of great people in Cuba too. I felt I was traveling with you. I was with this poet and his family, the Friends, the writers. I enjoyed. What to say. Thank you for this blog, and for the initiative. I am an Indian who lived in the US and now I am in London. I can resonate so much with the scenes in Cuba, and the experiences of Cubans. I have read Margerita Engle’s books and loved them all. Something about Cuba attracts me to it. I wish you all the very best! Lovely, beautiful blog, i would love to go to Cuba one day. I am so interested in everyihing. Please keep this blog open to try and inform Americans about the true Cuba, and relations with America l. God bless. ¡Bellísima historia, Ruth! Gracias por compartirla con nosotros. 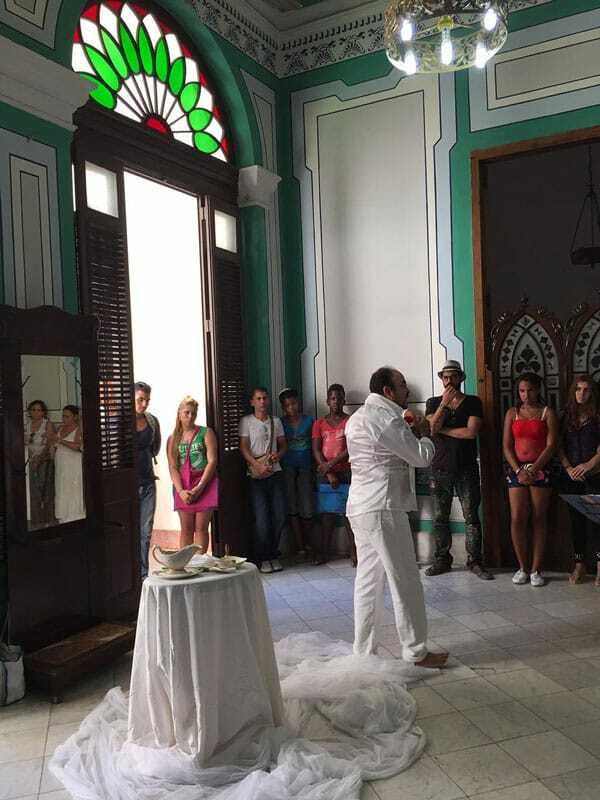 Nos llevaste contigo en tu viaje a Cuba, compartimos sus emociones, el encuentro con parientes y amigos, escritores y artistas. Favor publicar el poema de Dulce María Loynaz en español. Blessings to those with hearts unblind! Lindas palabras con tantos cuentos… Fue una vida bella, Llena de los colores de Mandavillas y el olor de los Tamaleros… Siempre feliz cerca de las playas de Miramar y alrededor a nuestras familias…con las conversaciones en Espanol y Judio….~ ??? Gracias por todos los puentes que a lo largo de todo el tiempo han construido y han inspirado a otros a colaborar en su construcción. Ya hablaremos más de un proyecto en marcha. I felt that this was a very interesting and powerful piece in the sense that it promotes a lot of positivity and hope for a lot of people. After leaving and seeing all the possibilities of bridges amongst various shows how there are multiple people working together at the same goal, which is an inspiring pieces. It shows how these bridges are being built allowing for people to relate and connect with one another. Within this story, I also liked the use of all the pictures and how they seemed to relate with each moment that was being talked about. For me, that seemed to give me an even better understanding of the trip as a whole, and the experiences that went along with it.